Germany's industrial production fell by 1.1% in July, dropping for the second consecutive month. Over three months, IP is advancing at a 1.1% annualized rate. Over six months, it is falling at a 2% pace. Over 12 months, it is rising at a 1.2% rate. All these growth rates are low. There is neither acceleration nor deceleration in train here. But there is not much to cause a policymaker to be very certain about what growth will be. Construction shows a steady even if slightly decelerating profile of gains. But taken on its own manufacturing shows a modest 0.8% rise over 12 months, followed by declines at an annualized -3.9% rate over six months and an -0.8% annualized pace over three months. As with the headline, there is no clear acceleration or deceleration trend here. But the data show declines over both three-months and six-months, even if the declines are not getting progressively worse, it is not good news. Moreover, German real sector sales and real orders both show persistent declines and both show sharply worsened rates of growth over three months and six months compared to 12-months. In the quarter-to-date column (QTD), all metrics even for construction show that IP is declining as the third quarter gets under way. The QTD calculation annualizes the change in July over the properly aligned Q2 average to generate an annual growth rate for each measure. QTD sector declines range from -0.6% for consumer goods to -1.5% for construction to -14.0% for capital goods. Both real manufacturing orders and real sector sales in manufacturing are falling at double digit rates. IP shows very different trends when arrayed by sectors. Consumer goods output is almost on a steady acceleration with a 12-month rise of 4% that falls to a pace of 2.2% over six months then surges to a 14.0% annual rate over three months. Capital goods do show persistent deceleration with a 12-month gain of 0.2%, decaying to a 6.2% annual rate of decline, followed by an 8.3% annual rate of decline. Intermediate goods are the in-between case as fitting for that sector. The output of intermediate goods falls by 0.1% over 12 months and the slide accelerates to a -3.3% pace over six months then it reverses to log a 2.7% annual rate rise over three months. These sector trends are confused and at odds with one another. It is no wonder that the IP headline is trendless as its components are all doing very different things. The rest of early reporting EMU does better than this with four of five early reporters showing output gains in July. Three of five show gains over three months as well. But like Germany, there is weakness over six months as four of five reporters show output declines over six months. Over 12 months, these early EMU reporters show two with output declines and three with gains. In the QTD period, two early reporting EMU nations have output declines, two log very strong gains, and one logs a moderate rise of less than 2% (annualized). The two non-EMU Nordic countries, Sweden and Norway, show mixed trends between them as well. For the moment, Germany seems to be leading the slowdown in Europe. The rest of Europe is showing mixed results with 12-month growth rates that range from +5.2% in Spain to -5.5% in Ireland. On the quarter-to-date, the EMU member range is from -10.8% in Ireland to +7.8% in Portugal. It is hard to keep track of the shifting players and the period of weakness. A rising trend for IP that had been in place based on year-over–year gains seems to have peaked in October 2017. Since then, there has been what appears to be an across-the-board slowing, allowing for volatility. Spain's recent strength is easily set aside because of its record of extreme volatility. 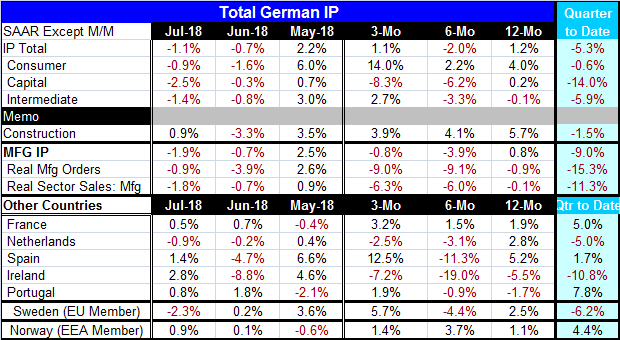 Germany, with rather well-behaved IP, is the one showing the most persistent weakness and that is not encouraging. At the same time, global economic data show that the U.S. has been one of the most consistently strong economies, but it too has some holes and question marks in its data. The U.S. trade spat with China may be getting set to ramp up more as President Trump is talking about imposing new tariffs worth more than $250 billion. China has just announced that it is going to increase its tax rebate to exporters to further assist them. Of course, this is just the sort of thing that the U.S. has bristled about, the way that China assists its exporters in various ways. It seems likely that conditions on the trade front are going to get worse before they get better. While China continues to ramp up its support for its exports, it also continues to insist that the tariffs aren't hurting it – it seems to be in denial about that. If more tariffs are imposed, there is likely to be a further international chill as exporters in third countries are likely to suffer from some collateral damage.